One thing we enjoy doing as a family is playing board games. In fact, on our school shelves along with our books you can find all sorts of board games stacked in between. They come in handy when we need a break or just when we want to have a little fun! 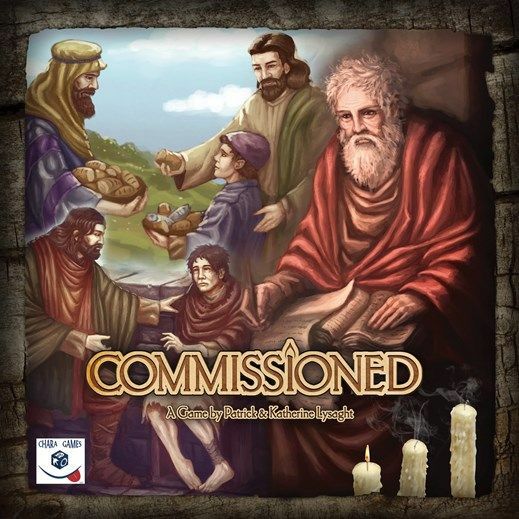 We recently tried out a board game from Chara Games called Commissioned. One of our favorite boards games that we have played for a while is more of a cooperative game, where there isn’t really a competition, but all the players either win or lose. That is how Commissioned is which was exciting for us because there aren’t that many choices on the market for games like that! We took it out of the box and I was impressed with the quality of the game pieces! The cards were thick which makes them harder to bend. Even the box was thick. I was very impressed with the quality. There was only one sheet of things that you had to punch out and they came out easily, and didn’t catch and tear like some other games have done. The night that we all decided to play, I made sure that everyone had looked at the directions and other included information before we started. The game is suggested for 14 and older which made so much sense now that we have tried playing! But just reading the directions had us second guessing a few things and so we made sure to watch the informative video that goes through an example show of a couple turns in the game. The game took a little bit to set up, and it changes every time you play, depending on the amount of players and also the game that you choose to play. So you need to make sure that you set the game up correctly. We followed the directions for the suggested first time playing and it was easy to follow. I think after doing it once that it would be easier to figure out on each subsequent game started. Even with reading the rules and watching the video, we messed up one part of the game the first time we played. We were wondering why our games were going away so quickly, but realized that we didn’t play one round correctly. It mentioned that we had to repeat a certain part three times, but we thought it was a different part. Once we caught on, it made much more sense and we felt silly for messing that up. Ah well, happens to the best of us…hehehe. It didn’t take long for us to get into the routine of the game once we figured everything out and played it correctly. We started laughing and getting into it and had a great time! Although the game is Biblical in nature, you don’t need to know anything about the Bible in order to play. It is just a themed game that you can win together with a little thought process and maybe a little luck. 😉 The whole goal is to get churches in each city on the board. We have made quite a few attempts but haven’t won yet. I just know we will win the next time we play though..We’ve got a system. Well, at least I think we do..ha! They have another game that is coming out just in time for the holidays and it is called 3 Seeds. I am excited to try that when it comes out too! That one is a card game and it does have just one winner. I enjoy this company and their new games. Even though they are from a Christian standpoint, you don’t need to know anything about it in order to play or win. It is a great idea to play with all sorts of people! But definitely a little older for the Commissioned game! It can be tricky! If you want to hear what others had to say about their time playing Commissioned, feel free to click the banner below!